We recently reviewed the TUF Gaming K5 keyboard, part of ASUS’s TUF line-up of gaming peripherals. While the K5 was weirdly positioned as a sort of premium membrane keyboard, the TUF Gaming M5 looks more like your typical gaming mouse. So let’s see what TUF-ness ASUS has injected into it. 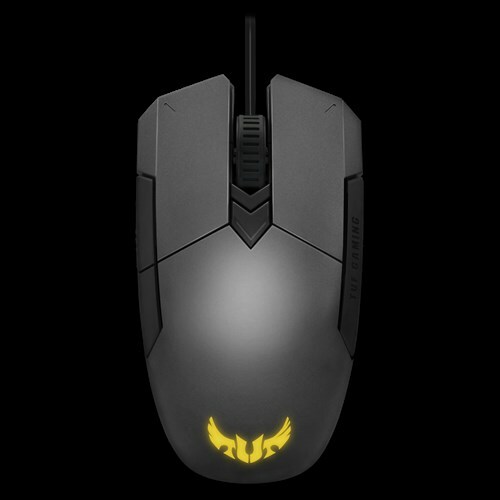 The TUF Gaming M5 has a symmetrical shape so you can use it with either hand. However, the two extra buttons on the left side suggests that the M5 was designed with right-handed users in mind. The M5 is quite short so it’s suitable for users with small hands while users with large hands will inevitably have to claw grip. There’s no rubber padding for your thumbs, but the sides are indented so as to keep it from slipping from your hand. 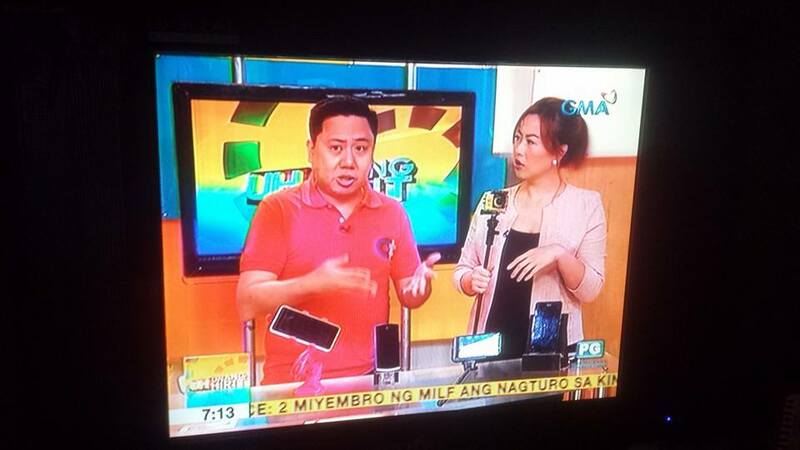 As for build quality, despite of the plastic construction, it’s still pretty solid. The matte silver does a good job of hiding nasty fingerprint and palm stains while the textured sides aids in grip. 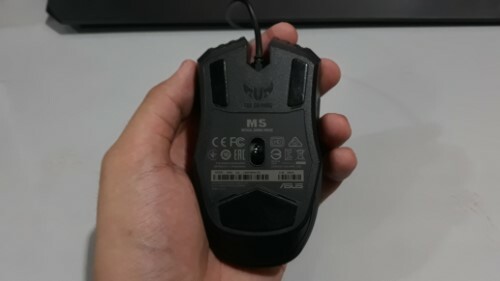 One thing I like about the M5’s design that I wish ALL mice have is that the scroll wheel has sizeable gaps to its sides so you can easily get dirt out of it to prevent jams. Under the M5, its three feet are able to mitigate any friction on even a semi-rough surface like a bare desk. The cable meanwhile isn’t the braided type, but although that would’ve been a welcome touch, the rubber insulated one here should last just fine. Good news for the RGB enthusiast: the M5 is ASUS Aura Sync compatible. You can change the default yellow light on the logo to pretty much any color you want. Just like the K5, you can do patterns too. Just link up your M5 to the Aura Sync utility software and set the lighting up. For button remapping and other settings such as the DPI and polling rate, you can use Armoury II. The first thing I noticed using the M5 was that it was light. Very light. This might be just because I was coming from an old Logitech G400s, but compared to that the M5 handled like it weighed nothing. Not that it was too sensitive because the PixArt PAW3327, with its 100-6200 DPI range, you have a wide spectrum to play with. So if you’re coming from a heavier mouse, you might want to adjust the DPI or your in-game mouse sensitivity settings to compensate. There is a DPI switch in the form of a button just behind the scroll wheel. You can leave it as a DPI switch to your preference. However for gaming, I personally find it jarring to suddenly switch DPIs even in FPS games, so I just bound it as a macro for “copy”. As for the buttons, the left and right buttons require just the right amount of actuation force. Not too hard but not too trigger happy like the Razer Deathadder. They use Omron switches for these and are validated for up to 50 million clicks. That’s 30 million more than what was quoted for the competeing G402. For the scroll wheel, scrolling felt fine with perceptible steps, but I wish it had a free scrolling feature. I’m not used to using additional buttons on the mouse and the M5 hasn’t changed that. My large hands meant that my thumb was almost always going to reach for the forward-most of these extra buttons. The texture to distinguish between them is difficult to perceive so I never got used to them. The scroll wheel clicks just fine and just hair harder to press than all left and right buttons. It’s nice to see that in spite of the TUF series being slotted under the ROG line-up, ASUS hasn’t really compromised the TUF Gaming M5 in any meaningful way. 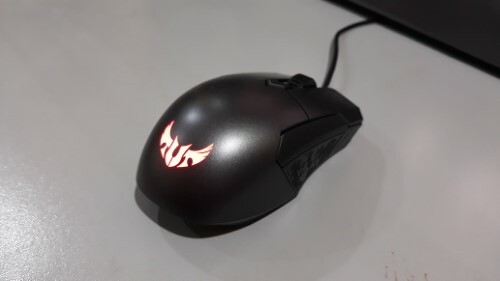 Sensor performance and handling is good, switches feel satisfying, build quality is above standard, and aesthetics is just on par with other gaming mice. 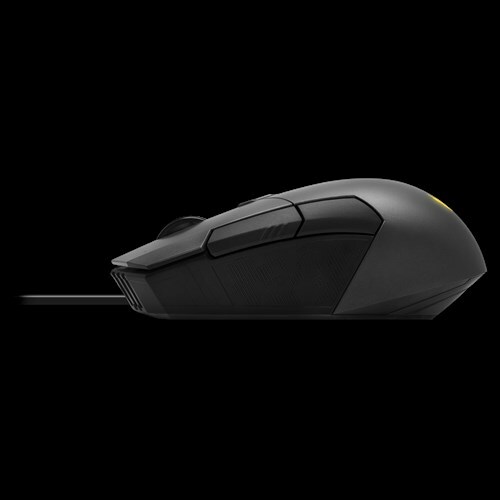 Priced at around Php 3,000, it retails for about Php 500 more than the popular Logitech G402 Hyperion Fury. From that perspective, the M5 has a herculean task ahead of it. But it does have some things going for it. 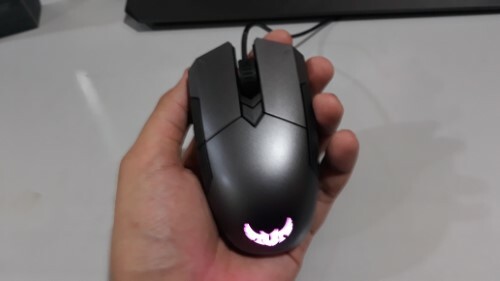 For those with smaller hands/claw grip users who prefer light mice it’s a good alternative to the aforementioned G402, which is longer, more suited to palm grip users/large hands, and isn’t ambidextrous. Add to that the extra durability testing and validation that ASUS put into the TUF Gaming M5, then that extra price may well be justified after all.